As host of the G-20 summit, Pittsburgh briefly will sit in the global spotlight. In this second article of a three part series featuring Pittsburgh, rust belt observer Jim Russell digs into migration and education trends and what it may mean for the region. Chris Briem (the blogger behind Null Space) jokingly called it the “Mystic Order of the Yinzerati”. He would later take the idea about the influence of Pittsburgh expatriates more seriously. I’ve referenced talk about a conspiracy theory involving the diaspora and how the current US President seems to favor the Steel City. How else does one explain the location of the upcoming G-20 economic summit? Recently, a journalist from Forbes interviewed me about the Pittsburgh renaissance. I mentioned the positive press the city has received and how the Burgh Diaspora seemed to be behind it all. At that point, she confessed that she was from Pittsburgh. The result? Pittsburgh is an archetype for the thriving 21st century city. I’m an avid Pittsburgh booster and I would bet that this round of rebranding will finally take root. However, that doesn’t mean I believe everything I read. Left out are all the challenges the region faces. Local bloggers fret about the city pension crisis getting swept under the rug, pointing out that the many myths used to promote Pittsburgh are disingenuous. Some natives have gone so far as to suggest that all the propaganda is nothing more than gilding a turd. After all, the population of Pittsburgh is still in decline. What about the brain drain? Ironically, the brain drain from Pittsburgh is the reason why I’m so bullish on this region’s future. Taking notice of the prolific Yinzerati, I began to see talent out-migration in a different light. Not every Rust Belt city could marshal the kind of sustained campaign that has benefited the New Pittsburgh. The more fantastic the fabrication, the more impressive the media blitz would seem. Surely expatriates from other shrinking cities could do the same. I’ll tell you why they haven’t. As brain drain is commonly understood, every region suffers from the same affliction. But the exodus from Pittsburgh was exceptional. Chris Briem charted the difference between unemployment rates in Pittsburgh and the national average from 1970 to present day. You might note that right now, never has the job market looked relatively better. What should really stand out is how bad the economy was in the early 1980s. It was a remarkable period of out-migration for young talent, robbing Pittsburgh of almost an entire generation. As I began to understand the connection between educational attainment and geographic mobility, I speculated that Pittsburgh’s brain drain was the result of a substantial investment in local human capital. The chronic decline in population is the result of successful workforce development policy. At least, that was my theory. Bill Testa, who works for the Federal Reserve Bank of Chicago, provided the evidence I was seeking. Compared with other Rust Belt cities and the nation over the period 1969-2006, Pittsburgh has anemic total employment growth. Strangely, Pittsburgh is a cohort outlier (in positive respects) if we consider gains in per capita income. While Pittsburgh ranked low in college attainment in 1970, its gains in this metric since then have been the most rapid. Perhaps not accidentally, Pittsburgh’s growth in per capita income also outpaced other cities in the region. Pittsburgh did a great job of educating its populace. This policy would betray the region during the hard times of the early 1980s. Dynamic labor mobility found expression in the only avenue available, relocation. The Mysterious Order of the Yinzerati was born. 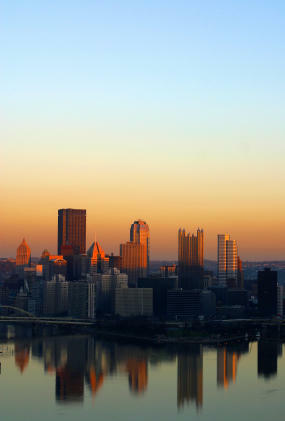 Pittsburgh hasn’t been able to cash in on the diaspora dividend until the last decade. As I noted above, positive spin about Pittsburgh isn’t anything new. During the early 1990s, the work of urban planner Paul Farmer was nationally admired. Cities such as Minneapolis hoped to mimic Pittsburgh success. Former mayor Tom Murphy, not remembered fondly in Pittsburgh, enjoys a strong reputation as a wizard of downtown revitalization almost everywhere else. I imagine the Burgh Diaspora actively evangelizing their hometown’s dramatic transformation. But if anyone was listening, they didn’t move there on the advice of these expatriates. The demographics quietly improved. What little immigration there was tended to be highly educated. Furthermore, the numbers of college educated residing in Pittsburgh are becoming more concentrated. All the while the population continues to decline and that’s what makes the front page, which brings me back to positive publicity push leading up to the G-20. Pittsburgh is finally ready to take advantage of the spotlight. With the global economy in dire straits, hell with the lid blown off never looked better. The underlying numbers, such as unemployment, are relatively strong. Pittsburgh is a place of brain gain, not drain. When national growth returns, people will begin to move again. Pittsburgh will be one of the places they will consider. Thanks to the considerable influence of the Yinzerati, historic federal expenditures will rain down on the land of Three Rivers. Chris Briem can tell you how many Yinzers end up in Washington, DC. Or, ask the head coach of the Washington Redskins. The point is that even if you don’t know much about Pittsburgh, many people inside the beltway do. The G-20 is just the tip of the iceberg. *For the record, my Pittsburgh connection is through my wife who grew up in the North Hills. Read Jim Russell's Rust Belt writings at Burgh Diaspora. Submitted by mobi on Sat, 06/06/2015 - 04:07. Submitted by VickiHuter on Wed, 05/20/2015 - 02:25. Submitted by mobi on Sun, 05/10/2015 - 02:43. Submitted by VickiHuter on Sat, 05/09/2015 - 08:23. Submitted by siya23 on Tue, 05/05/2015 - 07:56. Submitted by labtronixedinc on Thu, 04/23/2015 - 08:49. Submitted by labtronixedinc on Thu, 04/16/2015 - 08:49. Submitted by Richard G on Sat, 09/13/2014 - 06:30. Submitted by Richard G on Tue, 09/09/2014 - 11:09. Submitted by Richard G on Sun, 08/31/2014 - 02:59.